Following on from their 6-0 drubbing at Manchester City, which lead to some reports that Andre Villas-Boas’ job was in jeopardy at White Hart Lane, Tottenham responded by securing top spot in their Europa League group by winning 2-0 at Tromsø for the seventh victory in their seven fixtures in the competition this season, then holding the reigning champions, Manchester United, to a credible draw in the league on Sunday. Although the point in itself represents a good result for Spurs – they have not beaten United at home in the Premiership since 2001 – it was the manner of the performance that gave myself and other supporters hope for the rest of the season. Tottenham did not appear to be the same nervous, possession obsessed side that has been on display this campaign, instead they moved the ball around with purpose and were not afraid to run at their opponents, a trait most notable in Aaron Lennon on the right-wing, whose recovery from an injury means that we at least one of the quick attacking threats that were so potent in recent years, with the other – Gareth Bale – currently racking up the goals for Real Madrid, including a hat-trick this weekend. Spurs took the lead against the Red Devils twice on Sunday, firstly through a Kyle Walker free-kick, which he hit low and hard under the jumping wall; then with an absolutely splendid turn and strike from 25 yards by Sandro, his first for exactly a year and the sort of spectacular goal that would have brought about the old cliché of “If a Brazilian had done that”, had it not been for the fact that it was someone of that nationality who scored it. However, on both occasions United wiped out Tottenham’s advantage with goals from Wayne Rooney, first capitalizing on a mistake by Walker in the area, then from the penalty spot after Hugo Lloris had given Danny Welbeck the opportunity to fall over him to give referee Mike Dean all the excuse he needed to award a penalty to the visitors. Despite failing to hold on to get three points and another abject showing up front from Roberto Soldado – who missed a clear chance when he had been played through with a lovely pass by Paulinho and failed to be in position to finish off a Lennon pass across the face of the goal – the performance showed a positive response from Spurs to the previous weekend’s embarrassment and also came on the back of that Thursday night trip to Tromsø, which is 217 miles north of the Arctic Circle. After the match, Villas-Boas came out fighting in his press conference, singling out journalists who he believed had been unfair to him and not shown him the respect he was due – something that could be incredibly ill-judged if results do not improve, but the idea of creating a siege mentality in his squad is not a bad one, copying tactics in which his former mentor, Jose Mourinho, is an expert. Next up for Spurs is a trip across London for a game against Fulham, who lost 3-0 to West Ham at the weekend and in response, sacked their manager, Martin Jol, replacing him with another Dutchman, Rene Meulensteen, who had been brought in as first team coach just seventeen days prior to Jol’s dismissal. The defeat away at the Hammers was the fifth in a row for the Cottagers, who have now been caught for the number of victories they have gained this season by owner Shahid Khan’s other team – the Jacksonville Jaguars of the National Football League. Unlike the Jaguars, Fulham will not get a better draft pick the lower down the league standings they finish and, since they are now three points from safety in the relegation places, Khan could not afford to give Jol any more time if there is any chance of them turning their form around and avoid being demoted from the Premiership for the first time. As for Jol, it marks only the second time in his career he has been sacked, having suffered the same fate at Tottenham six years ago and – as somebody who was a big fan of his during his reign at White Hart Lane, as he had us playing entertaining football and guided us to two fifth place finishes, the highest we had ended up in Premiership era at that point – I hope he finds another job quickly and enjoys more success in his career. Those three points for West Ham helped ease the pressure on their manager, Sam Allardyce, as it was their first Premiership victory since they won by the same scoreline at Tottenham back on October 6th. On Tuesday, they will face Crystal Palace at Selhurst Park, the second game in charge of the Eagles for Tony Pulis, who could not help his new side to any points in his opening match, as they were defeated 1-0 away at Norwich. Meanwhile, Pulis’ former club, Stoke City, were on the wrong end of a 4-0 result at Goodison Park, as Everton – inspired by Gerard Deulofeu, the teenager on loan from Barçelona – enjoyed a convincing victory that moved them to within goal difference of the top four. Their next match, being played this Wednesday, sees them face their former boss, David Moyes, as the Toffees go to Manchester to face United; while Stoke host Cardiff, who suffered a 3-0 home loss against the leaders, Arsenal, on Saturday, which included two goals from their former player, Aaron Ramsey. Perhaps the biggest shock of the weekend was Hull’s 3-1 win against Liverpool – who before the game found out that their top scorer, Daniel Sturridge, would miss the next couple of months due to an ankle injury – though it was far from a surprise on the day given the manner of the two teams’ performances over the course of the 90 minutes. 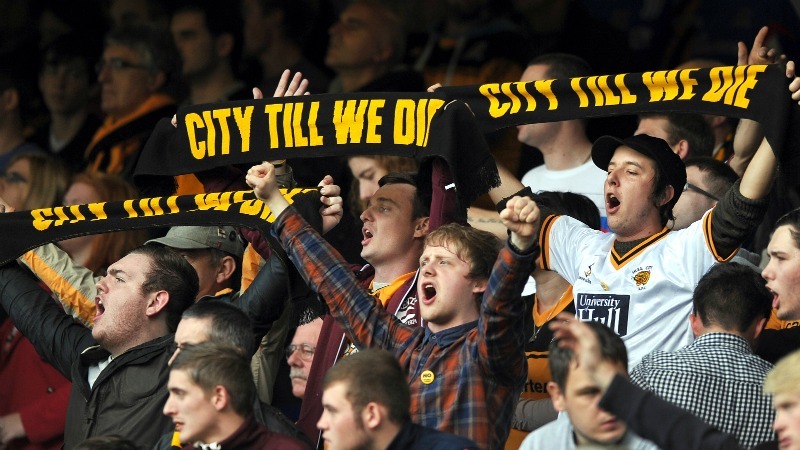 The one dampener for Steve Bruce’s men was that their victory came at home during protests from their supporters against their owner, Assem Allen, who had said in an interview that fans who were protesting his proposed name change of the club to “Hull Tigers” by singing “City till we die”, were welcome to die as soon as they like. His comments were as ill-judged as the thinking behind his rebranding idea, but most likely he is just trying to gain leverage with the local council over a proposed stadium extension he wants them to contribute some of the funds to, yet the whole issue is symptomatic of the Faustian deal supporters must make when a wealthy benefactor takes over their club. Hull are now in the Premiership on the back of Allem’s spending, but this issue would be even more of a topic if it arose at Manchester City instead of the soon-to-be-Tigers: would fans have a legitimate gripe if the Abu Dhabi United Group decided to change their name to something like the Manchester Oil Barons? Absolutely. But if you are going to accept the riches and success that comes with such a takeover, as City fans have done as they cheer on the likes of Sergio Aguero and David Silva, who would never have joined without the investment from the United Arab Emirates, then they also have to accept that the history and traditions of the club are at the mercy of owners whose primary concern is the money and prestige they can gain from such an “asset”. You may not be able to stop the club you love being taken over by a billionaire who does not actually care about your club, but if supporters do not show up to games or buy the merchandise, then the bottom-line is affected and the chairman would have no choice but to listen to the fans. However, if you accept the investment without reservation and enjoy the success it may bring, then complaints will ring hollow when the owner decides to rebrand your club’s name or colors – since Cardiff have had a similar alteration from Malaysian chairman Vincent Tan, who has changed their home strip from blue to red. If you want your team to remain loyal to its history and roots, then you must be prepared to sacrifice the vast wealth that might otherwise be available and with it, some success; but if you crave big-money signings and almost unlimited investment from a billionaire, then part of that deal means control of clubs being ceded to businessmen, not supporters. Elsewhere at the weekend, Newcastle maintained their perfect November, winning their fourth Premiership fixture in the month of November by beating West Brom, 2-1 at St. James’ Park; Southampton were the third team to score after 13 seconds this season – joining Stoke, who did so against the Saints, and Manchester City – but were beaten 3-1 by Chelsea, who scored all of their goals in the second half; City kept up their 100% home record with a 3-0 defeat of Swansea; while Aston Villa and Sunderland played out a goalless draw in Birmingham. The rest of the midweek fixtures – that I have not already mentioned above – see Manchester City try to improve their away form with a trip to West Brom; Liverpool entertain Norwich; Hull – who won at the Emirates in 2008 under the stewardship of Phil Brown and with the brilliance of Geovanni – head there again to face Arsenal; Southampton have a home match with Aston Villa; Newcastle travel to south Wales to play Swansea; Sunderland host Chelsea; and the two teams just above the relegation zone, Stoke and Cardiff, meet at the Britannia Stadium.